In recent days on La Réunion Island a meeting was held to celebrate the 30th anniversary of the sighting of the supernova 1987A (SN 1987A), the brightest of the last four centuries and for this reason a historic event for modern astronomy. For these celebrations scientists from the Hubble and Chandra space telescopes chose an animation derived from the model of a team of astrophysicists from INAF-Osservatorio Astronomico di Palermo, Italy led by Salvatore Orlando. In the night between February 23 and 24, 1987 the supernova was spotted in the Large Magellanic Cloud, a dwarf galaxy satellite of the Milky Way. 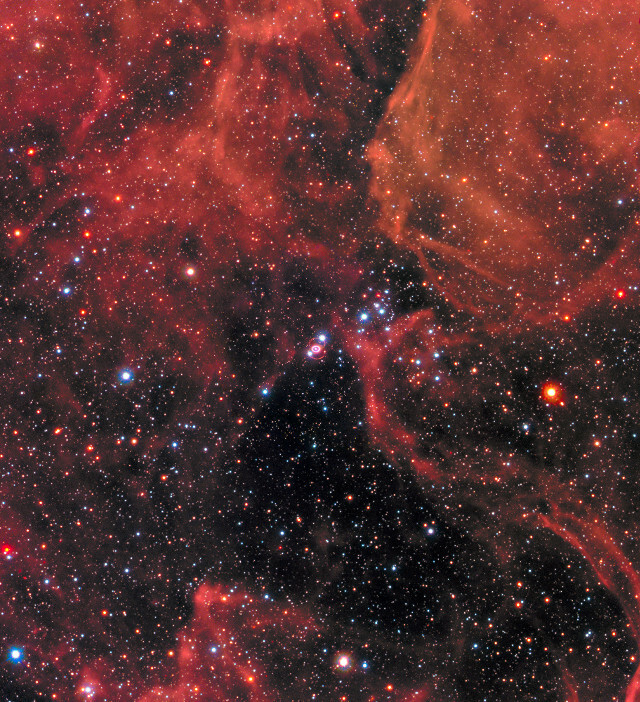 Over the three decades since, increasingly sophisticated telescopes have been aimed at the supernova remains, including a number of space telescopes. The supernova remains were among the first targets observed in 1990 by the Hubble Space Telescope, which captured images of the main ring around the remains of the exploded star and two fainter outer rings. Continuous observations led to a huge amount of information about what happens after a supernova but also about some of the events prior to the explosion. In fact, the observations of the expanding material made over the years allowed to understand that they were already ejected 20,000 years before the supernova. Strong ultraviolet emissions coming from the explosion charged the ring gas making it shine for decades. The shock wave from the supernova passed through the ring gas that surrounds it producing X-ray emissions that increased their intensity for years and NASA’s Chandra X-ray Observatory revealed those emissions’ increase from 1999 until 2013. Subsequently the X-ray emissions’ global levels have kept steady but the lower part of the ring started fading, indicating that the shock wave passed beyond the ring into a region where the gases are less dense. These three decades of studies were precious to understand supernovae but there are still many questions. For example, the origin of the two outer rings is not yet clear. Above all, astronomers are looking for traces of the remains of the star that exploded in the form of a neutron star or a black hole. Astronomers believe that the star that exploded was the blue supergiant that was identified as Sanduleak -69° 202 or Sk -69° 202 because after the light of the supernova faded it was impossible to find it. According to current models the core is what is left of that star and it collapsed but so far no telescope was able to see with what result. However several observations are following the gas ejected before and during a supernova that are traveling in space. Those are mostly lighter elements but there are also more or less elevated amounts of other elements – heavier ones – created during the death throes of stars and in the supernova. Probably some of those elements will contribute to the creation of new stars and perhaps even new planets in the distant future. The monitoring of the remains of SN 1987A will continue to find the neutron star or black hole remained and to examine their changes moment by moment. The possibility to study a supernova from the start with powerful and sophisticated instruments is offering great opportunities to discover the secrets of some of the most energetic events in the universe. The clip with the animation created by Salvatore Orlando’s team.